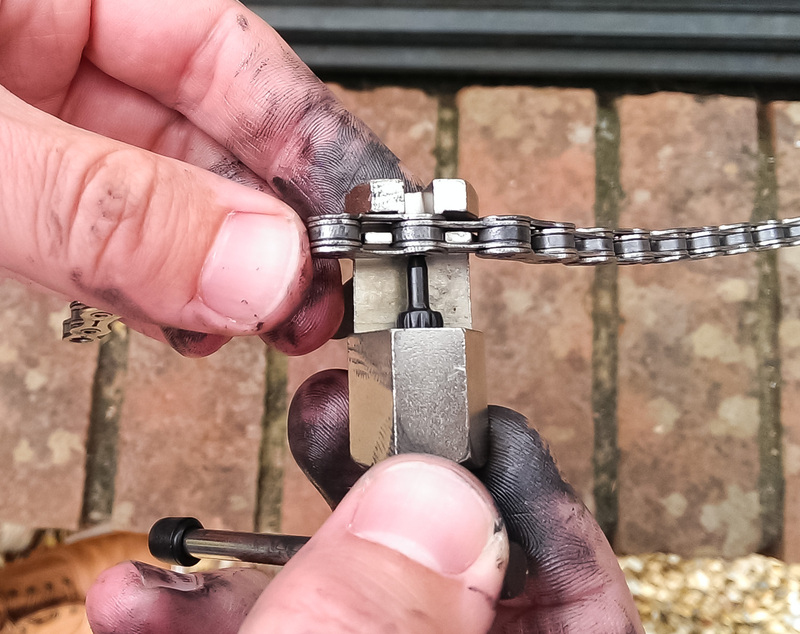 Changing your chain frequently is something you need to learn to do if you are cycling regularly as modern chains on derailleur–fitted bikes last somewhere around 2,000 miles before becoming stretched. Carrying on using a worn chain will cause damage to the rest of the drivetrain so paying £20 rather than £100 or more is a good saving. 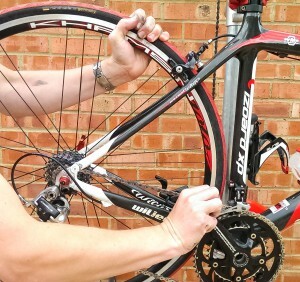 First of all you need to know when to replace your chain. 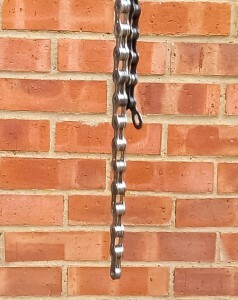 Chain wear tools are pretty cheap, normally around a fiver, and usually include two measurements. One at 0.75mm to tell you the chain is getting worn, and another at 1.0mm to tell you it must be replaced. 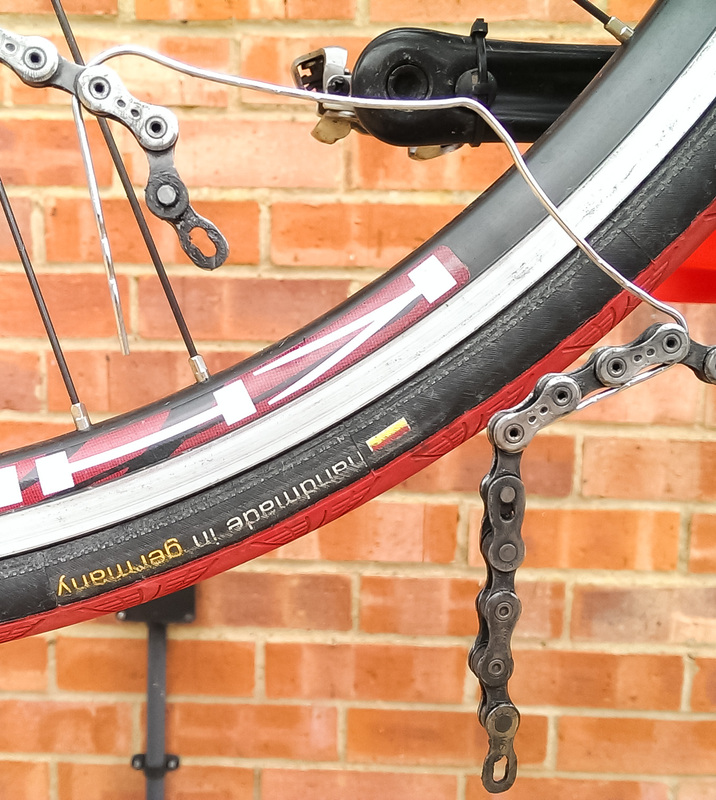 The advice I was given on my Cytech training course was to replace as soon as it hits 0.75 as wear rates increase rapidly. With a long summer of riding planned I thought it was best to swap out my old KMC 10 speed chain for a new one which I picked up for around £20 from one of the big online bike shops. 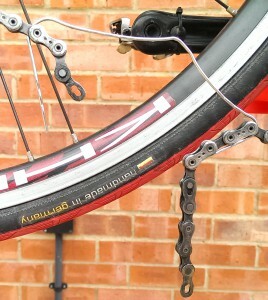 Although my bike comes with a Campagnolo groupset the original chain was a KMC unit and this is very common. 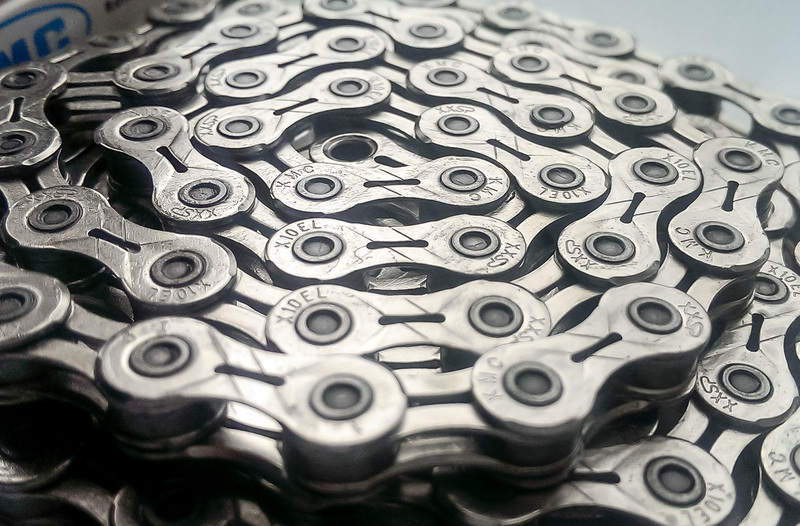 Manufacturers will always say you should use one of their chains but it isn’t necessarily the case and you can normally use any chain designed for the number of rear cogs on your cassette. 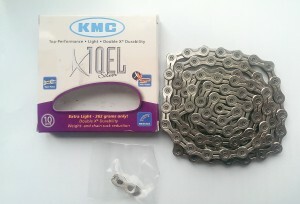 Campagnolo and Shimano chains often require special pins or tools to fit them but KMC don’t. 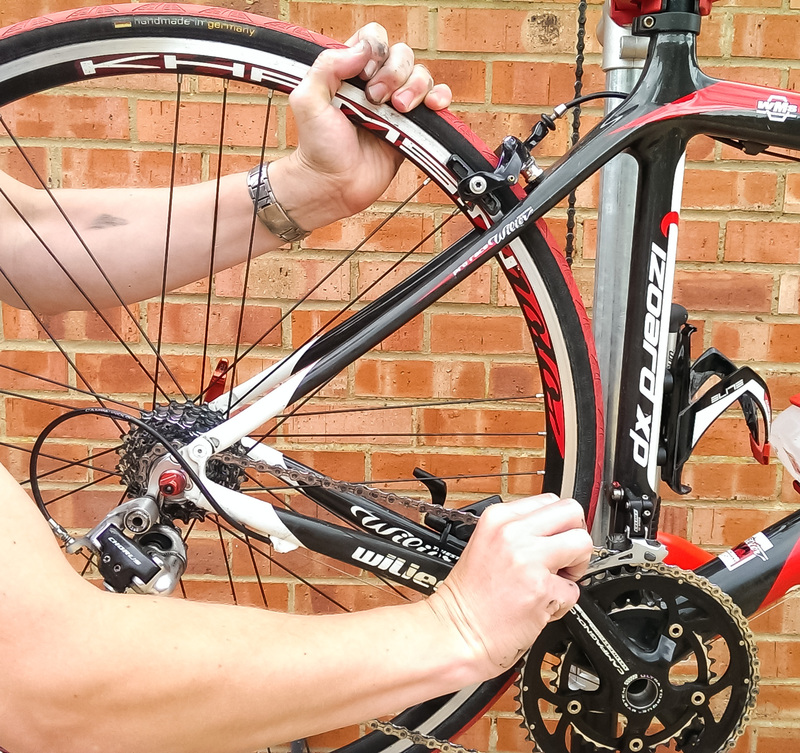 First things first, get your bike up on a workstand (essential equipment for anyone doing home maintenance) and find the special ‘missing link’ where the chain is joined. 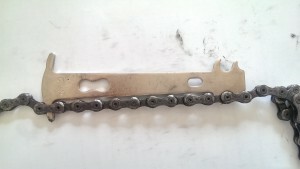 This is where you can split the chain for removal. 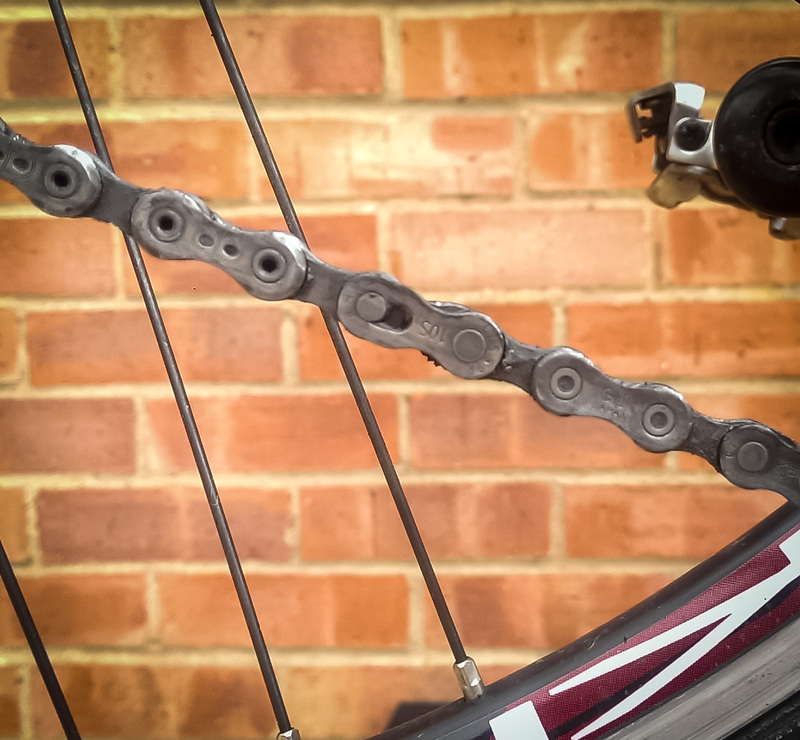 Make sure the chain is on the top chaining at the front and the bottom one at the rear to keep the chain as straight as possible and the rear derailleur not under too much tension. Release some slack in the chain to help you pull the link apart; here I use a piece of wire (one of those big paperclips) which gives me just enough slack. 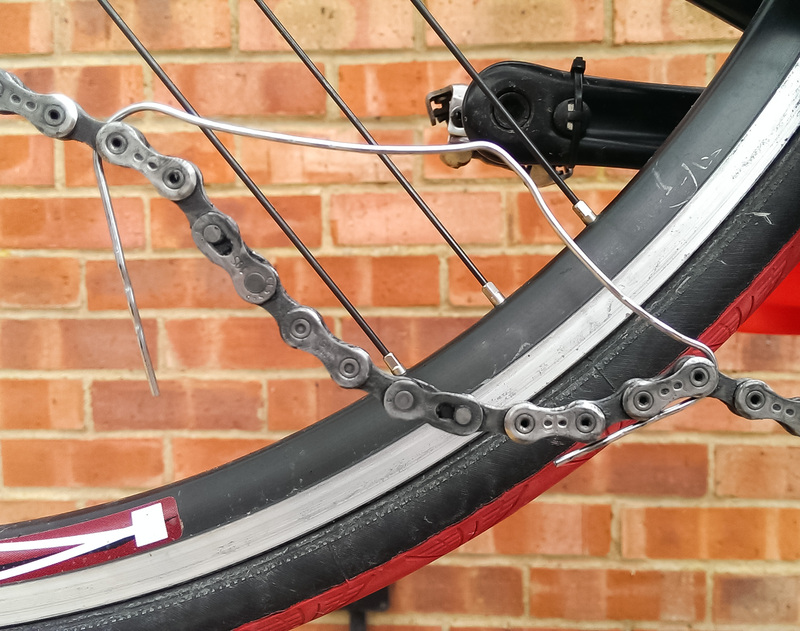 Now, you can buy special missing link pliers (£15 from Wiggle) or you can simply push the link together and see if that works – it did for me! 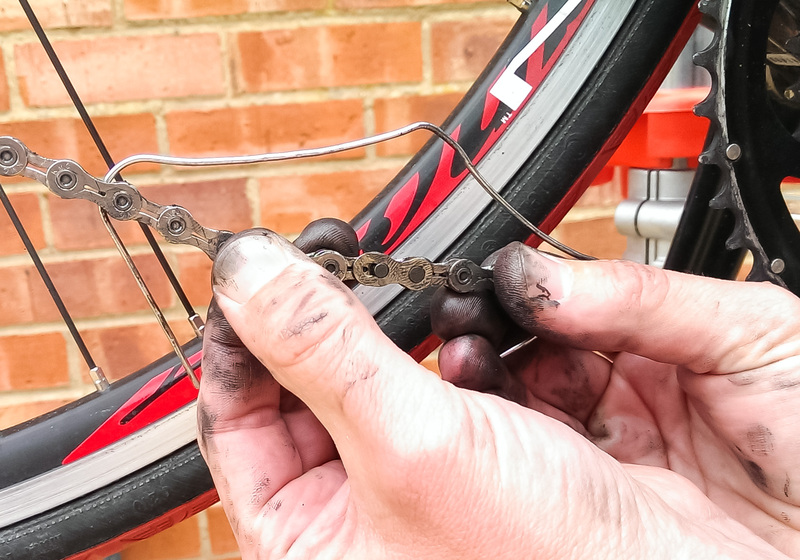 If you are throwing the old chain away it doesn’t really matter what you use to open the link as it will be going in the bin anyway – just take care not to hurt yourself. 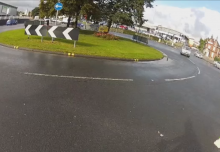 It was at this point I realised I had been over-lubing my chain lately! Once separated, remove the chain (remembering the way it goes through the rear derailleur) and measure it against the new one. Make a note of how many links you need to remove and then pop the pin out using a bog-standard chain tool. Double-check the length again and then pull the chain back through until you are ready to join it using the new missing link. 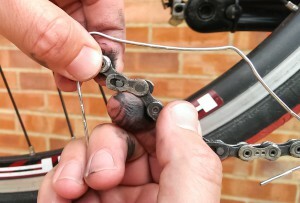 Take the tension out of the chain again and simply connect the two parts of the missing link together. 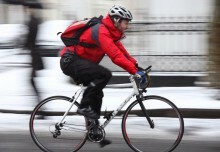 It’s easy to get the missing link to engage – you can use brute force or just hold the back wheel in place while pedalling forward. You will feel the pins pop into place then just check to make sure there’s no stiffness, lube (lightly) and the job’s done!